E's Van's RV-14A: Wings: Leading edges. Stall warner assembled and landing light cavity painted. Wings: Leading edges. Stall warner assembled and landing light cavity painted. 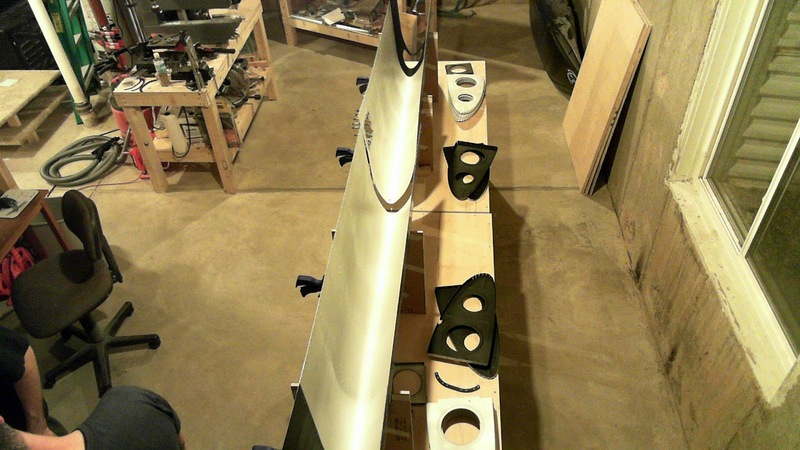 As I waited for riveting help on the top skins, I surreptitiously worked on the outboard leading edges and fuel tanks. Completed stall warner below. I had to grind down the screw hole on the vane to prevent it from binding between the mounting plates. The plans are clear that the vane should rotate freely. Makes sense since the vane must be in the airflow and capable of freely pushing up against (or not) the switch. Below are some leading edge and fuel tank parts primed as well as the landing cavity areas painted. I went with black on the latter since it would add a neat contrast to the wings when painted. This is how Van's demo RV-14A was done. And finally, the leading edge skins, with their landing light cavities painted, ready for riveting. I also have the pleasure of redoing the right wing tank attach assembly shim for the third time. The first attempt saw me miscut the piece, the second saw me dimple the wrong side. The third attempt should be the charm.